I used my first Catie’s Bubbles soap today, La Terre Verte. I was not disappointed. All the rave reviews are spot on. After loading my brush for 20 seconds, I had more than enough great thick, slick, cushioning later for three passes. It is a soft soap/croap and a tad bit softer than some. It will be sticking around! The jar is packed with a full 8 ounces of soap. Ingredients: Stearic Acid, Water, Coconut Oil, Potassium Hydroxide, Sodium Lactate, Glycerine, Fragrance, Patchouli Essential Oil. I finished off a tub in December, it took me about 2 and a half months of consecutive daily use. Definitely one of the best products I've used, the performance and scent were great from start to finish. The LTV is flat out awesome! And the matching aftershave is fantastic as well. After my first use of the aftershave (following an LTV shave, of course) my wife even made a comment of how nice it smelled. It's got to be good to get an unsolicited compliment from SWMBO. I agree, one of the best scents of one of the best soaps. I also like the aftershave, but wish it also came in a balm. Bob, great to hear you are enjoying the soap. Personally, I really enjoyed the complex scent of the LPV, Le Piment de la Vie. I've already got enough soaps to last my lifetime and now there's yet another that has caught my interest. I agree excellent soap. I was purchasing the elusive LPV aftershave and I added LTV on impulse because it had a matching aftershave. Now both have a steady spot in my rotation. (01-07-2015, 09:51 AM)MaxP Wrote: Well, this is challenging! Me too, I have enough soaps for the rest of my days! 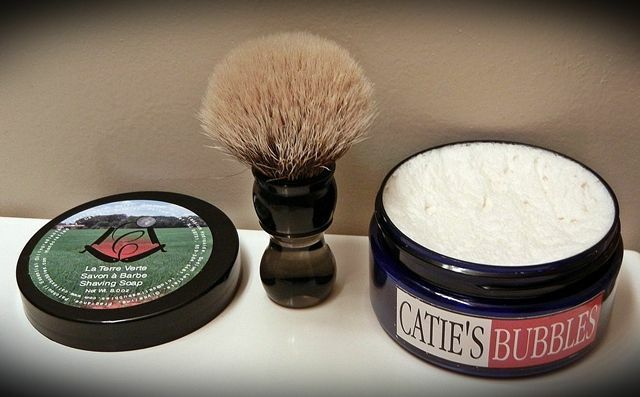 (01-07-2015, 05:54 AM)Coyote Wrote: I used my first Catie’s Bubbles soap today, La Terre Verte. I was not disappointed. All the rave reviews are spot on. After loading my brush for 20 seconds, I had more than enough great thick, slick, cushioning later for three passes. It is a soft soap/croap and a tad bit softer than some. It will be sticking around! I haven't tried Caties yet but sounds good from your review. Nice brush too. 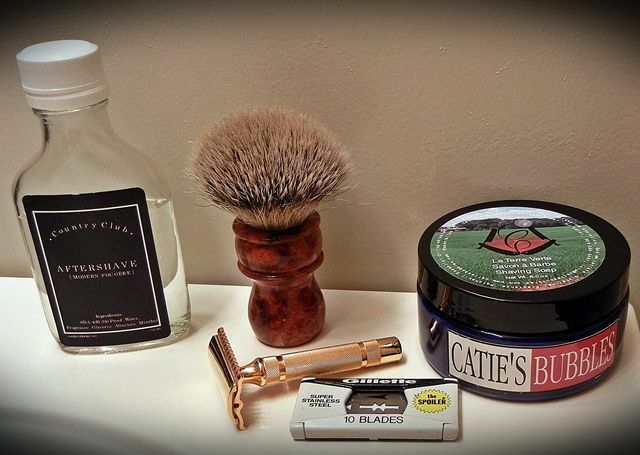 I just finished my third excellent shave with the LPV. This was my 6th day with this blade too, a Gillette Spoiler SS. I found that I need to cut way back on the loading from 20 seconds to 10. While this is a croap/soft soft soap, it is very soft, heavier on the cream side than the soap side. I believe I have it dialed in now for me. Sorry for the big bump here, but I recently picked some of this stuff up and I'm very impressed with it also. It actually caught my wife's attention during a shave. She walked through the bathroom and said "Which one is that? It smells amazing!" Then I showed her the container and she opened it and smelled it. She said it made her nostalgic, reminded her of a bottle of fragrance her grandfather used to wear. She couldn't stop smelling it. Would you guys classify this as a Fougere? It reminds me of one except I like it more than the Fougere's I've used so far, including MdC's.